Named for its donor, the Huth Psalter reveals its origin by listing in its calendar of feasts and litany Saints Hugh, Wilfrid, and John of Beverly?all associated with Lincoln or York. 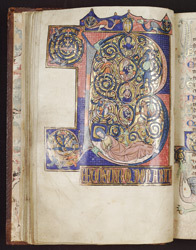 Medieval psalters could be used publicly in the liturgy or privately as a prayer book, with decoration, calendar and added prayers tailored for the use of an individual or community. Unusual features of its illumination give vivid impressions of contemporary concerns and devotional practices. The initial of Psalm 1 presents a variant of its usual theme, the Tree of Jesse. The tree of Christ's ancestors arises from the sleeping Jesse's body, but instead of selected ancestors or scenes of the life of Christ it bears scenes of David--as king, composer, warrior (accompanied by jousting knights)--topped with vignettes of the Virgin and Child and Christ enthroned in heaven.